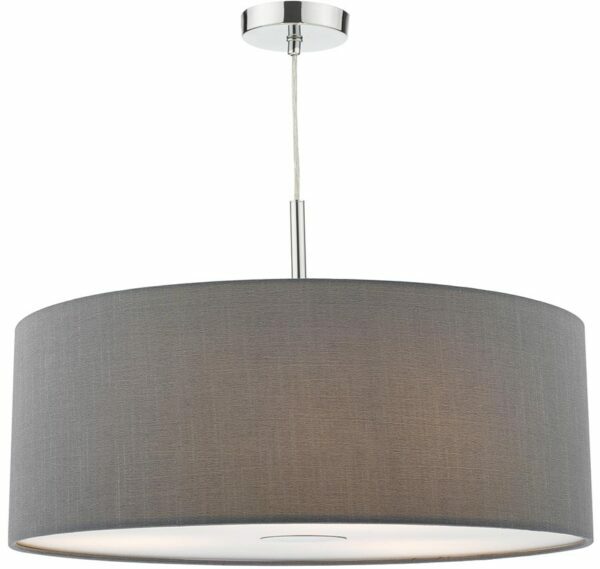 This Dar Ronda 60cm slate grey drum shade 3 light pendant with diffuser features a round polished chrome ceiling mount, clear flex suspension and chrome detailing. The 24″ shade is finished in smooth slate grey faux silk, fitted with a white acrylic diffuser for a softer light and fixed with a chrome retainer. A simple, elegant design that is crying out to be fitted above a dining room or kitchen table, in a living room or hallway. It looks fantastic in both traditional and contemporary interiors and features a soft light output to create a lovely ambience in any room. The enclosed nature of this shade pendant makes it ideal for use with energy efficient low energy or LED lamps to take advantage of low running costs. Height adjustable at the time of installation, please see below for more information. Also available as a 40cm diameter pendant light and in white or ecru, please see below. Dar lighting is widely recognised as one of the leading suppliers of a full range of innovative, quality lighting products such as the Ronda 60cm grey drum shade 3 light pendant you see here.